Koi Macher hal or Tel Koi is the strong flavor of mustard oil with lightly tempered on Kalo jeera (nigella seeds) and green chilies. This recipe is easy to make but yummy is taste. So, do try this recipe in home with mustard oil. 1. Take 6 Koi fishes and rub it with 1tsp turmeric powder and little salt. Keep it aside for 5-10 minutes. 2. In a pan, heat oil and fry the fishes. Make medium fry of the fishes. 1. In a pan heat 4 tbsp of mustard oil. 2. Once the oil heat give 1 slitted green chilly and ½ tsp nigella seeds. 3. Once the kalo jeera crackle pour little warm water into it. 4. Cook it for 5-10 mins and when it comes to boil, add salt, turmeric powder and Koi fishes into it. 5. Again cook for 4-5 mins in low flame and in between turn the fishes and add rest of the slitted green chilies. You can add red chili powder if you want it more spicy. Once it cooked add ½ tbsp of mustard oil and 1 green chily. Cook it for another 1-2min in low flame. 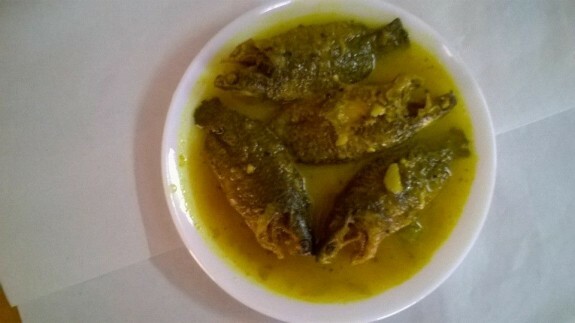 Your Koi Macher Jhal is ready to eat. Serve it hot with rice. Note: You can also add ginger and cumin powder paste if you want spicier and give it on the oil after nigella seeds crackle and sauté it for few minutes and then add the water.